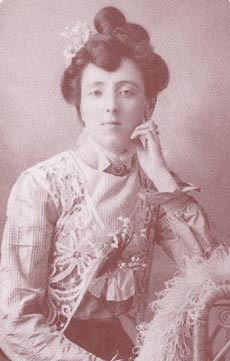 Lucy Maud Montgomery, or "Maud" as she was known to all who were close to her, is one of Canada's most beloved authors. A writer of poetry, short-stories, and more than twenty novels, she is known most famously for her series of books that brought to life irrepressible orphan, Anne Shirley. Anne of Green Gables was the first of seven novels that dealt with Anne's adventurous youth, her marriage, and finally, motherhood. The appeal of Montgomery's books crosses the boundaries of time, age, culture, and gender. Her works are translated into more than a dozen languages; and she maintains international best-selling status. She lived a remarkably sincere, humble, and sacrificial life of Christian virtue, the values of which in turn are unambiguously reflected in all her writings. Even though Lucy Maud Montgomery captured the world's attention with her descriptions of idyllic life on Prince Edward Island, her childhood was far from ideal. Montgomery was born on November 30, 1874, to Hugh John Montgomery and Clara Woolner Macneill Montgomery. The family lived in the small town of Clifton (now New London). By the time Maud was two years old, she had herself became orphaned. Her mother died after a long bout with tuberculosis. Her father found himself unable to deal with the grief over the loss of his wife and the prospect of raising a daughter alone. Hugh decided on settling in the western territories of Canada, where he remarried a woman named Mary McRae. Hugh Montgomery left his small daughter with Clara's parents, Alexander and Lucy Macneill (her namesake), in the small community of Cavendish, Prince Edward Island. Maud had a difficult and lonely upbringing with only two elderly people for company. As a result, many of her ideas for stories came to her as she had to invent and imagine playmates and parents. She lived through her imagination, beginning to write poetry and stories at a very young age. She also found comfort and solace in the beautiful island that was her home. She often walked along the sea shores and strolled through forests with her journal. She also became an avid reader at this time, often living vicariously through the novels she read. The only alleviation to the loneliness she felt were sporadic visits to Silver Bush, the farmhouse of her Uncle John and Aunt Annie Campbell and their children. Maud reveled in these visits with her cousins, desiring to make them last as long as possible. At the age of six her education began in a small schoolhouse located in the heart of Cavendish. Maud completed several years here, except for the school year 1890-1891, when she reunited and lived with her father and his new wife in Prince Albert, Saskatchewan. Not much is known about that year with her father, except that her first writing success was to come from her time in Prince Albert. Maud's poem, "On Cape LeForce," was published in the local newspaper, The Patriot. It may be presumed that the relation between Maud, her father, and new stepmother was not happy, and Maud was sent back to Cavendish to live with her grandparents once again. She arrived too late to begin the school year, and took her tenth grade courses the following year. However, Maud was a quick learner and a dedicated student. She surpassed many of her classmates and was accepted to Prince of Wales College in Charlottetown. She made up for the missed year of school by completing the two year teacher's course in just one year and graduating with honors. After her graduation from Prince of Wales College, Maud began teaching. After three years at three different schools on Prince Edward Island: Bideford, Belmont, and Lower Bedeque, Maud took a year to pursue higher education, an unconventional endeavor for a woman at that time. She studied English at Dalhousie University in Halifax, Nova Scotia and she continued to write. She received her first payments for her work while attending Dalhousie. Maud completed a year at the university, and then returned to teaching. While she was teaching at Lower Bedeque in 1898, her grandfather passed away. Leaving her post immediately, Maud returned to Cavendish. Because her widowed grandmother was alone and faced with the predicament of finding a new place to live, Maud returned to live with her grandmother. She took over the household duties and finances. She cared for her grandmother for the next thirteen years. For a brief time from 1901 and 1902, Maud left Cavendish, at her grandmother's urgings. Maud accepted a job writing for the newspaper The Daily Echo in Halifax. After nine months, however, she chose to return to her grandmother, expressing that her needs were greater than the need for Maud to continue a career, and she returned to Cavendish. These lonely years with her grandmother provided the solitude Maud needed to dedicate herself completely to her writing. She spent most of her day writing poetry and short-stories, and trying to get them published. Maud expanded her horizons and began sending work to publishers in Canada, America, and Great Britain. She, like most writers, faced a great amount of rejection. But, finally, she found a small audience for her work and started earning an income. It is estimated that in 1899, Maud brought home almost $100, a tidy sum for that time. The milestone in Lucy Maud Montgomery's life came in 1905, when she wrote her first novel. It was a charming and heart-warming story about a red-headed orphan girl named Anne Shirley. It took Maud two years to find a publisher, but the Page Company of Boston, Massachusetts, published it in 1908. She was 34 when Anne of Green Gables became an immediate success and put her on the map as a successful new novelist. She published the book under her pen name, L.M. Montgomery. The book was also filmed as a silent movie in 1919, with Mary Miles Minter, and later became a successful television movie in 1985, with Megan Follows. A 1934 version directed by George Nicholls, Jr is considered the best adaptation. All but one of her twenty novels were set in her beloved Prince Edward Island. A tiny and insignificant place to most of the world, Prince Edward Island now has a booming tourism industry. Dedicated fans of Montgomery's novels frequent the island to see the places and people that Maud so lovingly brought to life in great detail. In 1911, Maud was to leave the Island she loved so much. Following the death of her grandmother, she married Ewan Macdonald, to whom she had secretly been engaged since 1906. Maud did not have many romantic suitors, only two that she recollects in her journals, and she was often considered a spinster by the town. Needless to say, it was a shock to many when, at the age of 37, she finally married. Ewan was a Presbyterian Minister. Soon after the wedding, the couple moved to Leaskdale, Ontario, where Ewan had taken the position of minister of St. Paul's Presbyterian Church, Leaskdale in present-day Uxbridge, Ontario. This marked the last time that Montgomery would ever live on Prince Edward Island, but she revisited it often in her writings. The couple soon became a family, as Maud gave birth to a son, Chester Cameron Macdonald in 1912. In 1914, Maud gave birth to another son, Hugh Alexander Macdonald, who died at birth. This was a tragedy in Maud's life, one that she never quite recovered from. She threw herself into the duties of a minister's wife, often giving care and service to congregation members, and taking none for herself. The very next year, 1915, Maud gave birth to her final child, (Ewan) Stuart Macdonald. Besides being a very attentive and active mother, Maud also helped her husband in his many duties, organized charity events, and still continued to write novel after novel. In all, Maud wrote eleven books while living in the Leaskdale Manse in Ontario. The manse was sold by the church to the city and is now the site of a very popular tourist attraction, The Lucy Maud Montgomery Leaskdale Manse Museum. In 1926, the family moved out of the Manse and into the Norval Presbyterian Charge, in present-day Halton Hills, Ontario. This too, has been set up as a memorial to Montgomery and is the present day site of the Lucy Maud Montgomery Memorial Garden. Maud was an avid writer of letters as well as books, and her friends, family, and fans were impressed at the correspondence she kept up with all of them. She also diligently wrote in her journal, recording her depression at the death of her son, her political thoughts and feelings concerning World War I, and most of all, her relationship with her husband and sons. Married life was not always blissful for Maud, as Ewan suffered greatly from various types of moody depression. In her journals she wrote down all her feelings and difficult moments that influenced and afflicted her life, and in her novels she recorded all her memories of the beauty, nature, peace, and humor of Prince Edward Island. After Ewan's retirement, the couple moved to Toronto to be close to their children. Lucy Maud Montgomery died in Toronto on April 24, 1942. At her request, she was taken back once again to Prince Edward Island to be buried at the Cavendish Community Cemetery in Cavendish, close to the site of her childhood home. At her death, she left 10 volumes of personal diaries (1889-1942), whose publication began in 1985. Her husband died one year later. The Lucy Maud Montgomery Institute at the University of Prince Edward Island is dedicated to the publication, appreciation, and information concerning Montgomery's works. ↑ L.M. Montgomery Institute, Homepage. Retrieved February 26, 2008. ↑ Prince Edward Island, Anne of Green Gables. Retrieved February 26, 2008. ↑ L.M. Montgomery Institute, L.M. Montgomery. Retrieved February 26, 2008. Works by Lucy Maud Montgomery. Project Gutenberg. History of "Lucy Maud Montgomery"
This page was last modified on 2 August 2018, at 16:01.